Roll-n-Go’s newest model, the 750 is the most affordable shore docking system. It combines durable, rust free components with all the standard features you’ve come to expect from the leader in shore docking. 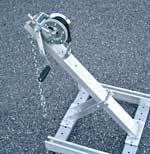 18′ overall length, 1,100lb. winch with a 20′ strap and (12) non-marking, polyurethane “donut” rollers make this the ideal model for smaller fishing, sail and row boats. 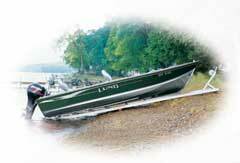 Two rail width settings and three winch height adjustments accommodate many types of watercraft. Available with 9′ Extensions and Leg Kits for use on contoured shorelines. MAX. WEIGHT CAPACITY 750 lbs .